A replica of the nation’s first corn-ethanol blended gas station will be on display during the upcoming Nebraska State Fair, August 24 through September 3. 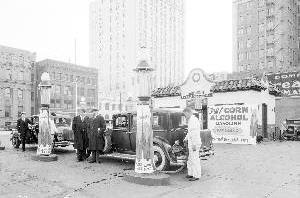 The exhibit was created based on a 1933 photograph of the Earl Coryell Co. filling station that was located in downtown Lincoln. The Coryell station was the first gas station in the U.S. to sell gasoline blended with corn alcohol which we now know as ethanol. Visitors will learn more about the long history of corn-ethanol. Only in the last 20 years has ethanol really been able to gain a foothold as an accepted alternative fuel. The replica filling station will be a fun and educational way to learn more about the history of ethanol.